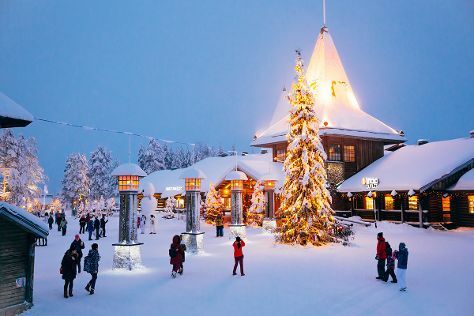 Start off your visit on the 29th (Wed): stop by Your Piece Of Finland, then take an in-depth tour of Arktikum, then Head underground at Syvasenvaara Fell, and finally get in on the family fun at Santa Claus Village. Here are some ideas for day two: find something for the whole family at SantaPark - the Home Cavern of Santa Claus and then take an exotic tour of a safari tour. Singapore, Singapore to Rovaniemi is an approximately 18.5-hour flight. You can also do a combination of flight and train; or do a combination of flight and bus. The time zone difference when traveling from Singapore to Rovaniemi is minus 6 hours. Traveling from Singapore in May, expect Rovaniemi to be colder, temps between 12°C and 3°C. Finish up your sightseeing early on the 30th (Thu) so you can travel to Savonlinna. Start off your visit on the 31st (Fri): contemplate in the serene atmosphere at Kerimaki Church, see the interesting displays at Lusto - The Finnish Forest Museum, explore the historical opulence of Olavinlinna Castle, see the interesting displays at Savonlinna Provincial Museum, then don't miss a visit to Pikkukirkko, and finally pick up some local products at Savonlinna Market Square. On the 1st (Sat), you'll have a packed day of sightseeing: explore the striking landscape of Kolovesi National Park. For where to stay, ratings, maps, and other tourist information, read our Savonlinna vacation planner. You can fly from Rovaniemi to Savonlinna in 6 hours. Other options are to do a combination of flight and train; or drive. Traveling from Rovaniemi in May, expect nights in Savonlinna to be about the same, around 4°C, while days are somewhat warmer, around 17°C. Finish your sightseeing early on the 1st (Sat) so you can drive to Porvoo. Start off your visit on the 2nd (Sun): steep yourself in history at The Runeberg Home, stroll through Fredrika Runebergs Park, don't miss a visit to Porvoo Old Town, see the interesting displays at Porvoo Museum/Holm House, then take in the spiritual surroundings of Cathedral of Porvoo, and finally get to know the fascinating history of Castle Hill. For maps and more tourist information, read our Porvoo road trip planning website . Traveling by car from Savonlinna to Porvoo takes 4 hours. Alternatively, you can fly; or take a train. In June in Porvoo, expect temperatures between 21°C during the day and 11°C at night. Cap off your sightseeing on the 2nd (Sun) early enough to go by car to Turku. Start off your visit on the 3rd (Mon): test your problem-solving skills at popular escape rooms, get your game on at Moomin World, then let the kids burn off some steam at Adventure Park, then take in the spiritual surroundings of Turku Cathedral, and finally browse the collection at Turku City Library. 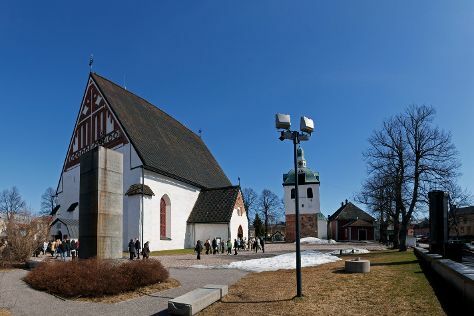 Get ready for a full day of sightseeing on the next day: step into the grandiose world of Turku Castle, make a trip to Archangel Michael's church, and then trek along The Archipelago Trail. To find ratings, photos, traveler tips, and tourist information, read our Turku trip planner . Drive from Porvoo to Turku in 2.5 hours. Alternatively, you can do a combination of bus and train; or take a bus. In June, daytime highs in Turku are 20°C, while nighttime lows are 9°C. Wrap up your sightseeing on the 4th (Tue) to allow time to drive to Helsinki. Pack the 7th (Fri) with family-friendly diversions at Linnanmaki Amusement Park. And it doesn't end there: step into the grandiose world of Sea Fortress Suomenlinna, contemplate in the serene atmosphere at Kamppi Chapel of Silence, don't miss a visit to Senate Square, and admire the natural beauty at Observatory Hill Park. For photos, where to stay, and other tourist information, you can read our Helsinki trip planner . Getting from Turku to Helsinki by car takes about 2 hours. Other options: take a train; or fly. In June, daily temperatures in Helsinki can reach 21°C, while at night they dip to 11°C. Wrap up your sightseeing on the 7th (Fri) to allow time to travel back home.